OBJECTIVE: Moderately malty with toasty and caramel malt flavor. Earthy, spicy, with citrusy hop bite. Dry, crisp, and grainy finish. Aroma of grapefruit. No added acid, sourness, or tartness from fruit. ACTUAL OUTCOME: Amazing grapefruit aroma before sipping, great nose. Sourness of the grapefruit peel clobbers you from behind. 3 months in captivity mellowed the beast somewhat. Too sour. If you attempt to brew this recipe, zest the grapefruit but do not add the peel! Start the yeast starter on Thursday evening before brewing on Saturday evening. 1. Heat 3 gals water to 165 degrees. 2. Add grains and steep 30 min at 152-156 degrees. Sparge with hot water (up to 170 degrees). 3. Stir in liquid malt extract and bring to a boil. 4. Add bittering hops and boil 60 min. 5. Add finishing hops and boil 15 min. 6. Add aroma hops and boil 5 min. 7. Cool wort to yeast pitch temp on the yeast package. Secondary fermentation: Drop temp 5 degrees per day to 42-45 degrees. Lager for 5 1/2 weeks before dry hopping. Begin dry hopping at the beginning of the last lagering week. Zest five grapefruit. Then slice remaining grapefruit rind into 1” x 2” strips. Add 1 oz dry hops and grapefruit zest and peel to a nylon bag and soak in carboy for 7 days. Stir once daily. Remove after 7 days. Lager 3 more weeks then keg. This dryhopping smelled absolutely glorious! A Leafblower Cider brewed by Erin and Dave. 5 gal batch size, 6 weeks start to finish, serve between 45-50 degrees. Goal taste profile: Dry apple cider with some apple flavor. Actual taste profile after kegging: Definitely has alcohol over 5%. Dry, no sweetness. Some apple flavor left. Some tang from citrus. Body is very thin, almost watery. I shouldn’t have topped it off with water to 6 gallons. Great apple cider aroma, but not a lot of flavor to back it up. Cool the wort to 80 degrees. Sanitize a carboy then add 1 gallon distilled water to it. Transfer the juice to the carboy. Rinse the kettle with 1 gal distilled water and add it to the carboy. Top with enough distilled water to reach 5 gal batch size. Pitch the yeast starter. Primary fermentation (1-2 weeks): Maintain 70 degree temp until fermentation is under way, then drop temp to the low end of your yeast’s preferred temp range. Preferred ferm temp for WLP775 English Cider Ale yeast is 68-75 degrees. Ferment to dry flavor, about two weeks. If fermentation is slow or smells sulfurish, boil then add ½ tsp yeast nutrient every 24 hours until fermentation seems finished (up to a total of about 2 ½ tsp for the batch. More than that can add yeast nutrient flavors.). Make sure to boil the yeast nutrient for 10 min before adding to the wort. Rack to secondary (4+ weeks) at cellar temp (50-70 degrees, whatever ya’ got!). Pasteurize 8 oz raisins and 8 oz dried plums by steaming for 15-20 minutes. Boil 0.8 oz oak chips for 15-2- minutes, then add chips and boiled water to wort. Sanitize 4 lbs variety of tart apples. Discard stems and bottoms and dice. Sanitize a small lemon and an orange, then zest. Do not add pith or peel. Just zest. Keg. Remove the fruit. Top with distilled water to 6 gallons. I ended up adding 1 gallon distilled water to replace the volume removed when I removed the fruit and zest. This was a mistake! Sep 10: added ½ tsp yeast nutrient. I added a heater to the room to raise temp to 69 because I realized that the yeast’s preferred ferm temp range is 68-72. Sep 12: added ½ tsp yeast nutrient. I raised the heater temp to 72. Sep 18: racked to secondary. Cellar temp ranged from 68-70 during secondary. Oct 9: Added the dry hop ingredients. Oct 23: Kegged. Dropped temp to 40 degrees and force carbonated. Later raised temp to 45-50. Hello, there. I caught you smilin’ at me. 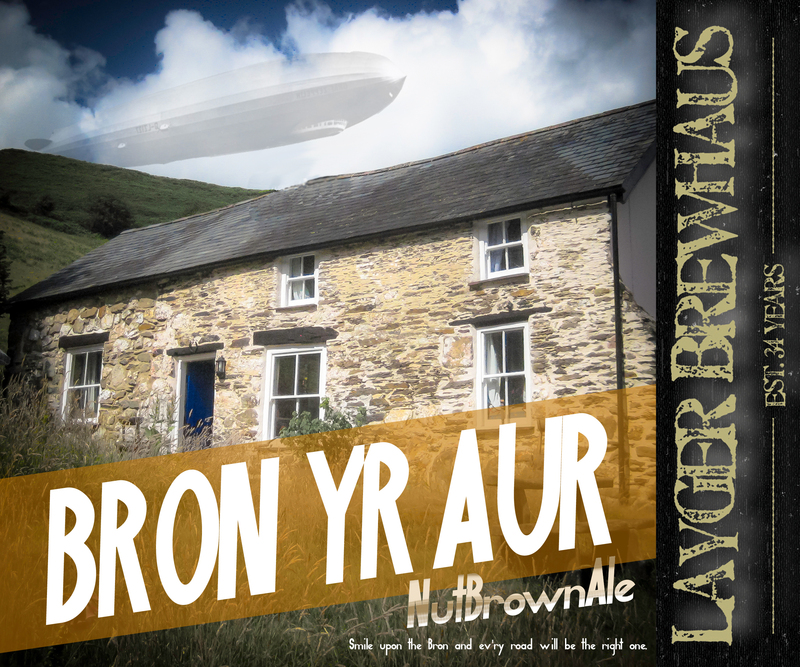 I’m Bron Yr Aur, a Nut Brown Ale brewed the way I should be, with the wettest hard water, caramelized grains, a touch of barley and chocolate malts. 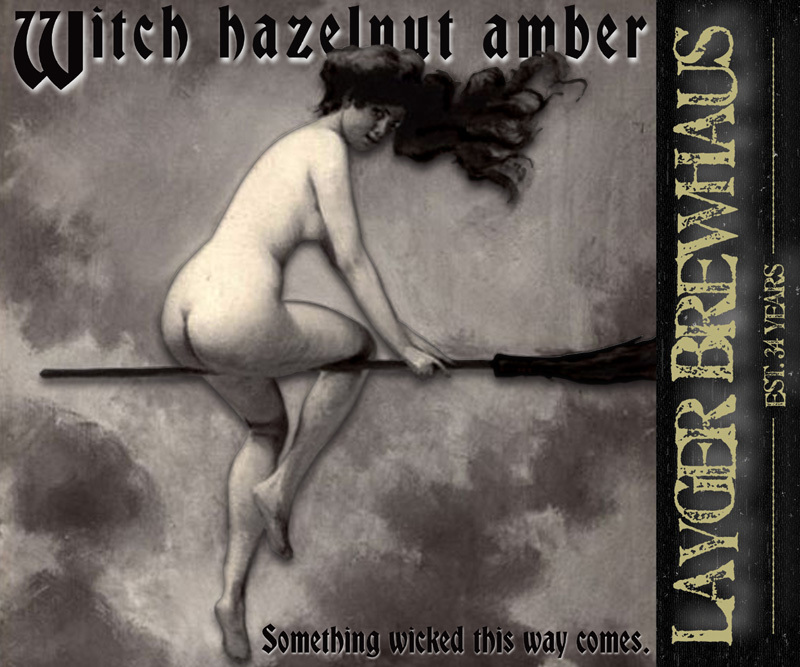 Mingling with the acrid autumnal Golding hops, this is an ale that will always treat you right, no matter the occasion, dish, or time of day. When you smile upon the Bron, the road you choose is always right. 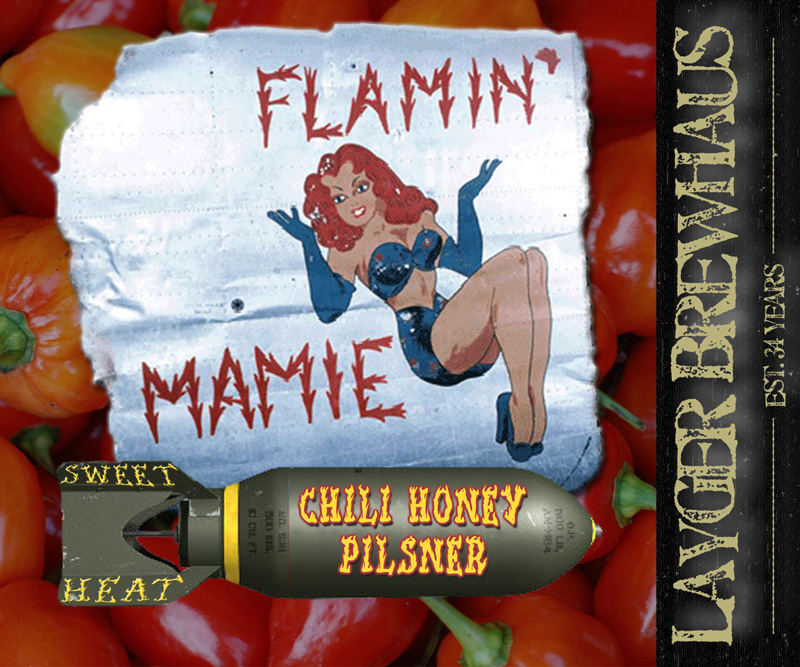 Longtime Layger Brewfriends may recognize this mashup between Steampunk Lager and Flamin’ Mamie Chili Honey Pilsner from Oktobertheseventhfest Part Drei in 2008. 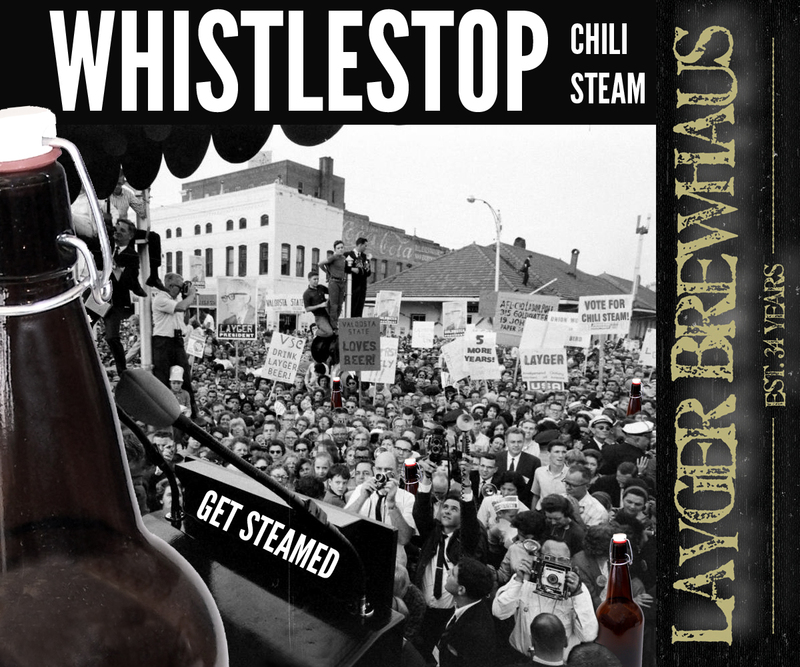 Whistlestop drinks smooth and spicy like Steampunk yet ratchets up the heat in the back of the mouth. Get steamed! 1. Bring 1 ½ gallons water to 180 deg or so. Water should be steaming but not boiling. 2. Crush the grains, add to grain sock, add to water. 3. Steep the grains 30 minutes. 4. Remove the pot from heat. Sparge the grains. 5. Pour the amber malt extract and the light dry malt into the pot while stirring. Once thoroughly mixed, bring the pot to a boil. 6. Add the bittering hops: 1 oz. Centennial (10.5% alpha acid). 8. Add 1 oz Irish moss. 10. Add the aroma hops: .25 oz Mount Hood (5% alpha acid). 12. Remove pot from heat. Discard hops. 13. Cool water to 85degF. 14. Add 3 gallons cold water to bring the total volume up to 5 gallons. 16. Add the yeast when the water temp is between 65ºF-75ºF. 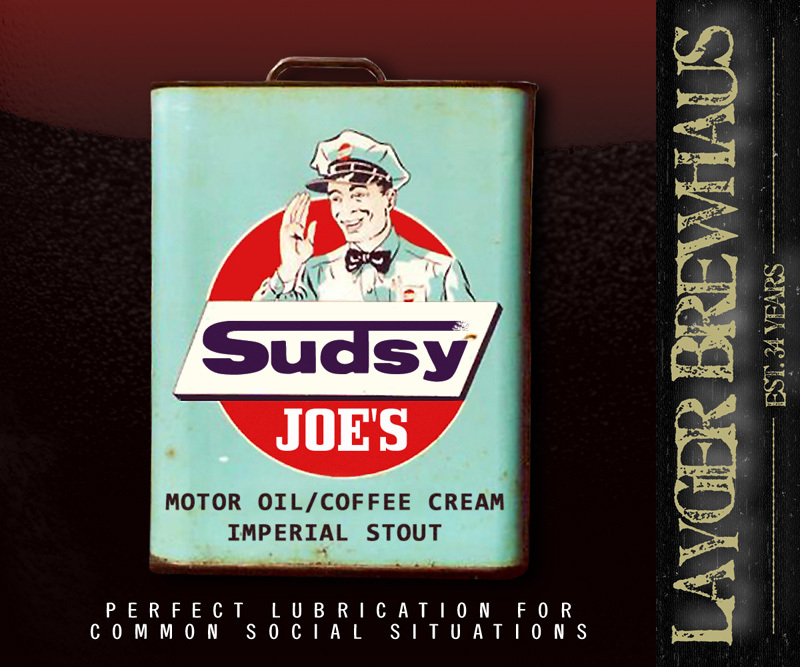 This recipe is a substantially modified version of the Layger Brewhaus Imperial March Stout recipe which was based on the “88 Draught Stout” recipe from a recipe book. 52 ounces cold-pressed coffee concentrate, filtered (decaf): This must be made at least 12 hours before brewing. Add .75 lbs of coarsely ground, decaf coffee into a clean stock pot. Add 52 ounces cold water. Stir until all coffee grounds are soaking wet and no dry pockets remain. Soak for 12 hours (do not heat). Filter using coffee filter into a separate container. Discard the spent coffee grounds without sparging. Consider filtering the coffee concentrate a second time to remove coffee silt. This 52 ounces of coffee concentrate would normally be mixed 3:1 before being drunk, yielding 156 ounces of drinkable cold-pressed coffee. 156 ounces is ~25% of the total, 5 gallon (640 oz.) wort volume. 1. Add gypsum to 2 gallons water, stir well. Let sit. 2. Crack the grains. In a separate pot, combine 1 gallon of water with the roasted barley, the crystal malts, the chocolate malt, the Victory malt, and the black patent malt and heat to 175 deg F. Steep at 175 deg F for one hour. 3. 30 minutes into the steeping, begin heating the 2 gallons of gypsum water. 4. After the grains have steeped for an hour, sparge the grains and add this fluid to the 2 gallons gypsum water. 5. Add the malt extract to the gypsum water. 6. Bring to a boil, add .5 oz Chinook hops. 7. Boil for 75 minutes. 8. We are unsure when to add the lactose. During the April ’08 brewing, Dave added the lactose directly to the room temperature coffee concentrate and it all settled to the bottom. Even vigorous stirring didn’t dissolve the lactose into the liquid. When the wort had cooled to 100 degF, Dave added the coffee/lactose mixture and stirred, but the lactose still didn’t seem to dissolve fully. 8 oz is a lot of lactose, so maybe it’s just a quantity issue, however, we recommend adding the lactose at the end of the boil to help it dissolve. If this doesn’t work, consider adding the lactose when adding the malt extracts next time. Still, make sure not to add the cold-pressed coffee concentrate to hot water or it will become bitter/acidic. Add the coffee as directed below. 9. Add .5 oz Saaz hops. 10. Boil 2 minutes, then add .5 oz Tettnanger hops. 11. Boil 3 minutes, then remove from heat. 12. Cool the kettle in an ice bath for 30 minutes, then add cold-pressed coffee concentrate. 13. When wort has cooled to 70 degrees F, add the yeast, stirring and aerating well. 14. Transfer to primary FERMENTOR and top off with cold water to 5 gallons. 15. Ferment 21 days at 68 deg F, then bottle.